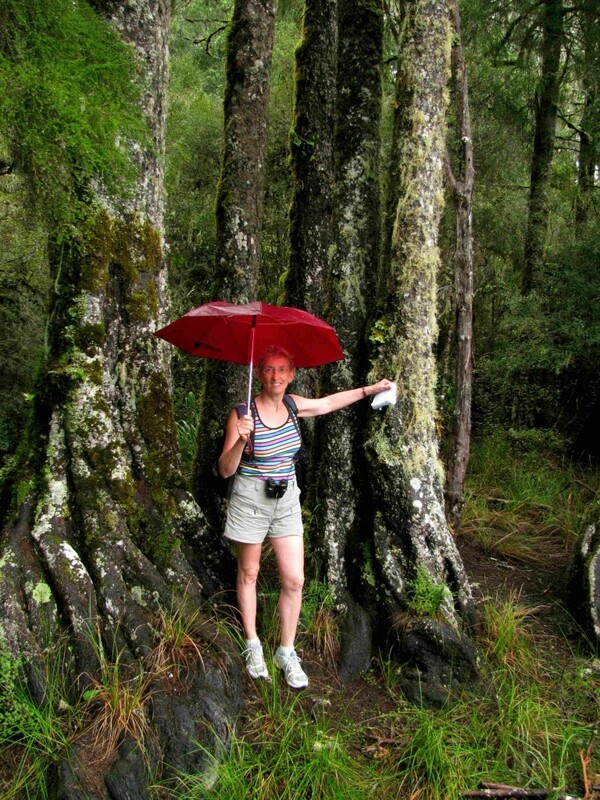 At 9 a.m., after driving farther into Whirinaki Forest Park, Vilis and I set out for Arohaki Lagoon on a track that led us first through scrub dominated by tea tree, toetoe, cabbage trees, bracken, and blackberries, and then into dark, damp rainforest. 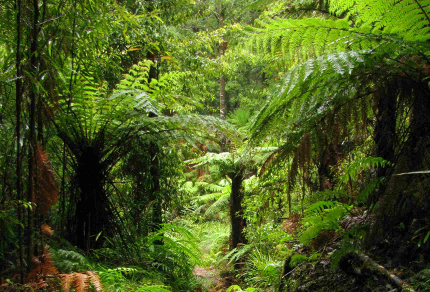 Tawa and tree ferns surrounded us, the latter’s dead fronds wet cinnamon in the dim forest light. We climbed and descended alongside a dry ravine, and then through open forest with the classic New Zealand forest structure of four layers of vegetation and mosses and ferns dripping from tree trunks and coating horizontal surfaces. 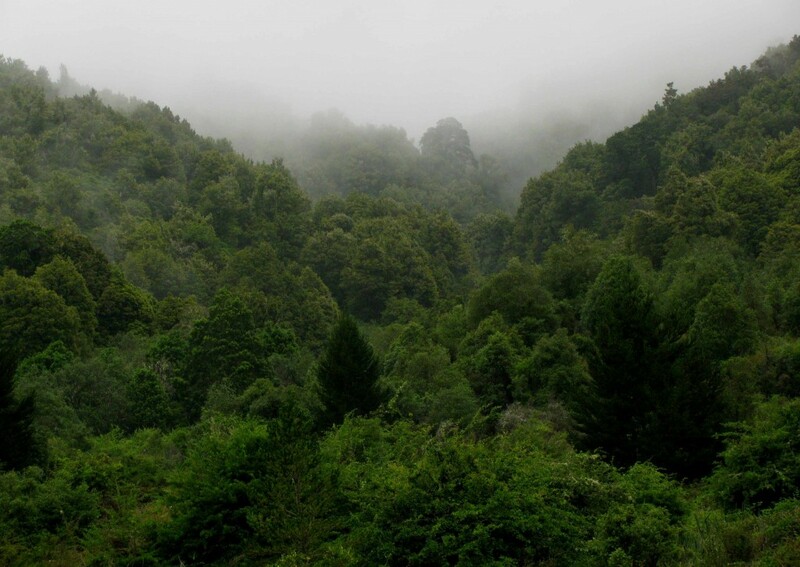 I heard the tantalizing voices of birds high in the canopy, their whistles, clicks, liquid gulps, twitters, warbles, and clear tones a morning chorus delayed by rain that once again spilled down onto the central North Island. We reached the lagoon after hiking for 50 minutes, the track opening abruptly to a view of open wetland lush with reeds and surrounded by slender kahikatea with icecream-swirl root buttresses and lichen-mottled bark. Frog voices rubbed the wet air with loud, rasping songs, and mist floated between ridges of forest cloaked hills. On closer inspection, we saw that the kahikatea trunks were furred with pale crustose and fruticose lichens, some of the latter hanging like loose tufts of hair, and that the draping of the trunks by the lichens gave them a variegated appearance. In the distance, across the lagoon, that variegated appearance took on an almost silvery hue that contrasted sharply with the vivid green of the wetland reeds and gave the water-loving kahikatea forest an ethereal beauty. Although not possessing the impressive girth of rimu or mataī, the kahikatea – which may reach heights of 50 metres and are New Zealand’s most ancient tree species1 – exuded an aura of trim elegance. While we inspected nearby representatives, a tomtit perched on a kahikatea twig flicked its wings and, in turn, inspected us. 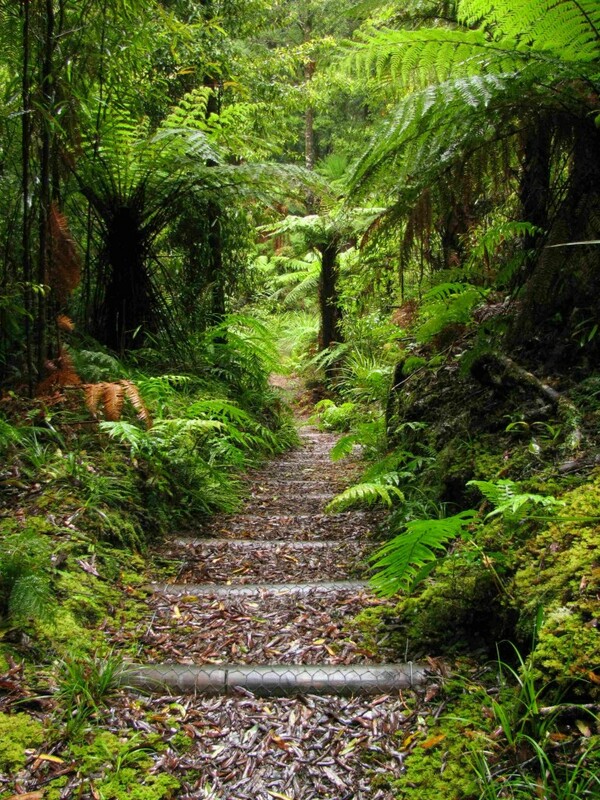 On the return walk, Vilis and I stored up images of tree trunks almost black against the vivid green rainforest understory, of a curious, dusky-grey New Zealand robin, and of tree fern crowns resembling brilliant emerald mandalas lighting the darkness in the depths of the dry ravine. These we took with us as inspiration against the expanses of dairy pasture and pine plantation. We drove out of Whirinaki Forest Park and north to Murupara on a twisting road, with drizzle speckling the windshield and cloud hanging on the hilltops, wrapping both indigenous and ‘exotic’ forests in mystery. Heading north toward the geothermal hotspot of Rotorua, we paused in early afternoon to hike to the summit of Rainbow Mountain located near the junction of SH 5 and SH 38. Called Maungakakaramea or ‘Mountain of Coloured Earth’ by the Māori, the mountain is itself a site of geothermal activity. 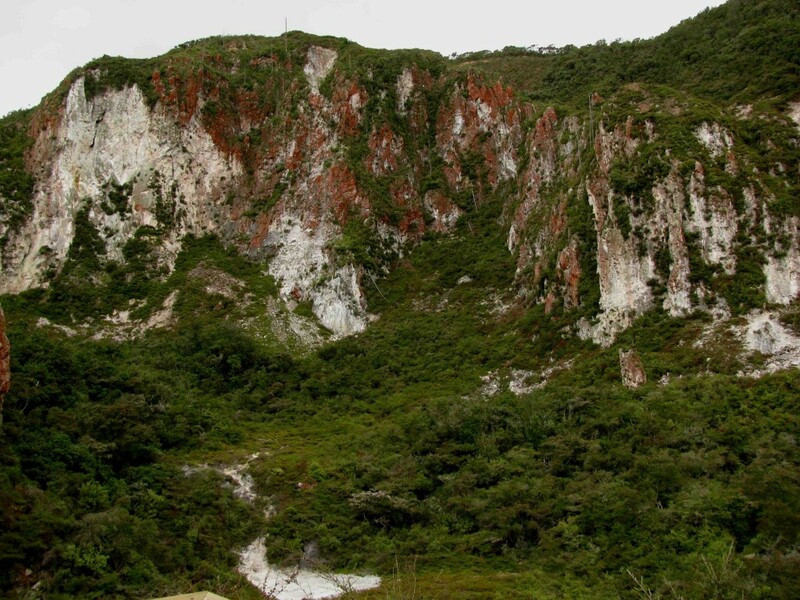 In spots on the steep track that ascended to the summit, the ground felt warm to the touch, and steam issued from pink gravel avalanched from rock faces streaked with brick red, peach, white, and pale green. 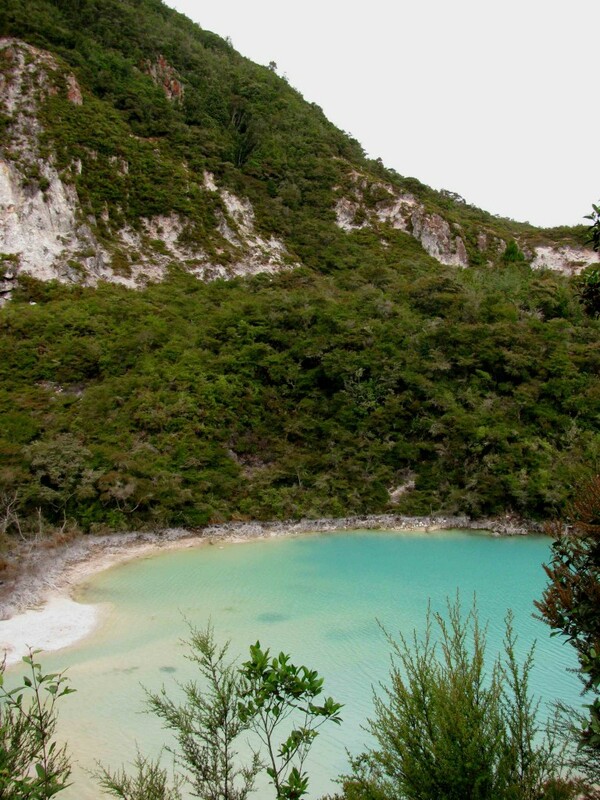 White deposits of minerals surrounded a crater lake, and stunted vegetation – scrub dominated by the tea trees mānuka and kānuka and ground-hugging shrubs similar to Canadian crowberry – crept up the mountain slopes. Given a temporary reprieve from rain, we hiked in brilliant light (occasionally even in sunshine), spotting a variety of birds in the low-growing vegetation. A shining cuckoo with iridescent green back and green-barred, white underparts sang its two-tone song. Fantails, a tomtit, and a grey warbler flitted about in the stunted shrubs. Tūī flew across the crater lake valley, their white feather poi dangling from their necks, and a long-tailed cuckoo called its harsh, tearing vocalizations while skulking out of sight in dense shrubbery. 1. Andrew Crowe. Which Native Tree? 1992. Penguin Books, Auckland, p. 40.